I think every single person in my family loves BLTs, particularly with some fresh garden tomatoes. Some people might want to leave a little of this off and add a little of that, but at the end of the day, Bacon, lettuce and tomato are a timeless and wonderful combination for the ages! I decided to lighten up this classic in the form a a bright summery salad. 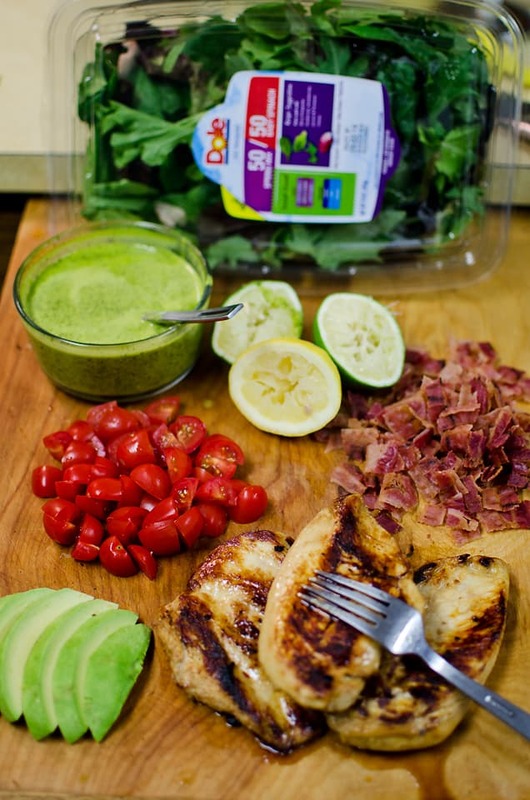 Instead of mayonnaise slathered on some bread, we are serving up our BLT on a bed of greens dressed with a fresh citrus tomatillo dressing with some added chicken and avocado for a healthy, filling and delicious entree salad. Start out by marinating your chicken breasts for at least 2 hours and up to 24 hours. 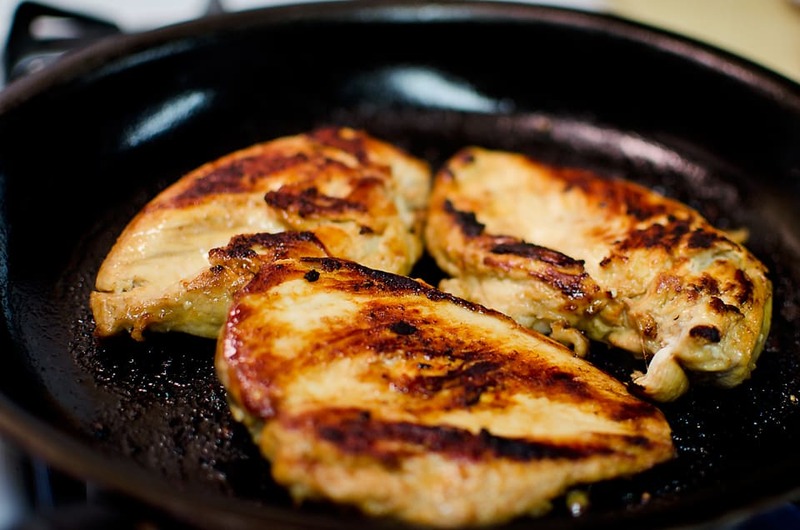 Remove the chicken from the marinade and place in a hot saute pan with olive oil. Grill the chicken breasts about 4 minutes on each side, until cooked thoroughly. Don’t forget to pound out the chicken breast before grilling, or they won’t cook evenly and be as tender. Let the chicken sit for at least 5 minutes before cutting it up into 1/2″ strips. This will allow the juices to set, and your chicken to stay nice and moist. Next up, combine all of the dressing ingredients in a food processor or blender. 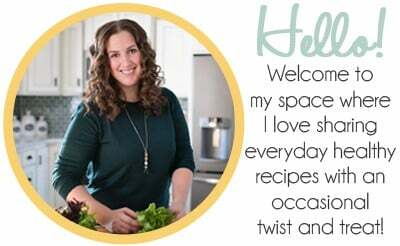 Personally, I like to put them in a bowl and use my immersion blender for a quick blend, and most importantly, for fewer dishes to clean! 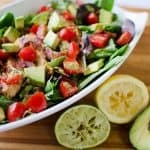 After you have everything prepped, begin assembling the salad by tossing the greens with the dressing and layering with the remaining ingredients. 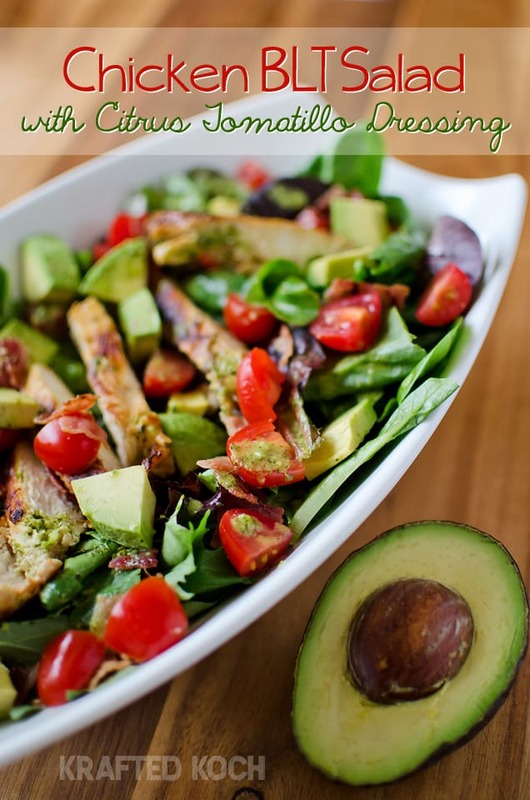 Save a little dressing to drizzle on top and you are ready to serve this colorful and flavorful salad! 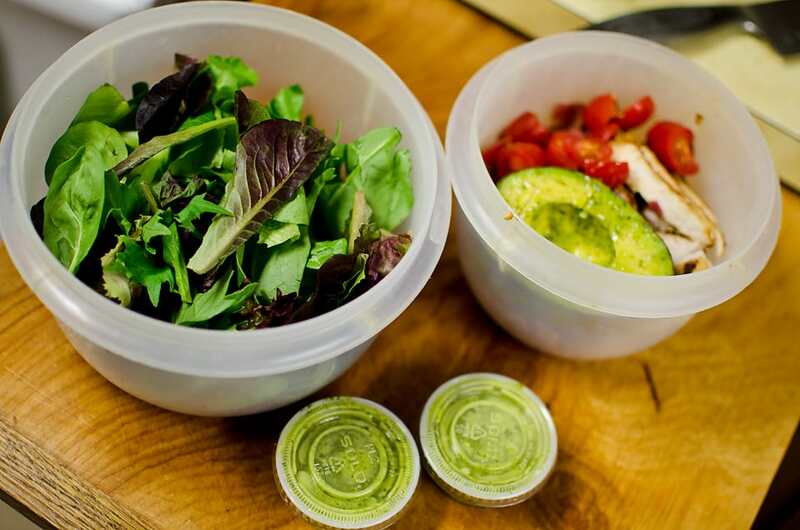 This salad makes for a great lunch the next day too, if you hold off on dressing the greens and store the ingredients in separate air tight containers, it is so easy to assemble at the office or on the run! 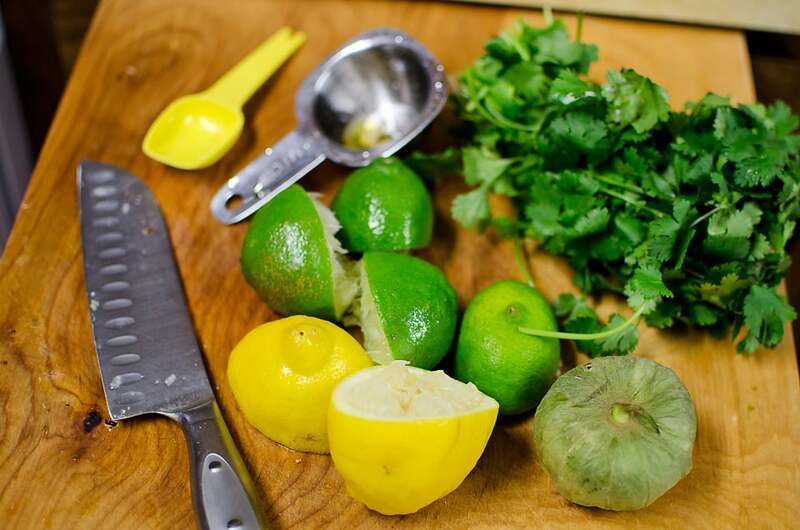 One important tip for storing cut avocados, is to toss them them with some citrus so they don’t brown. Seeing there was so much citrus in my dressing already, I just dipped the avocado in that to keep it fresh until the next day. 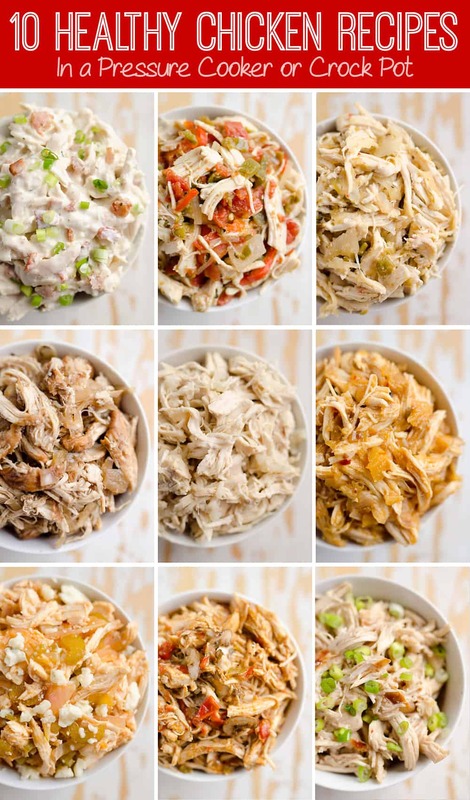 Combine all marinade ingredients in gallon zip lock bag with raw chicken breasts and squeeze the marinade around the chicken so the chicken is well coated. Seal the bag with as little air possible and use a rolling pin or any blunt object to pound out the chicken breasts until about ½ inch thick. This will ensure they cook evenly and are nice and tender. Allow to marinade at least 1 hours or overnight. 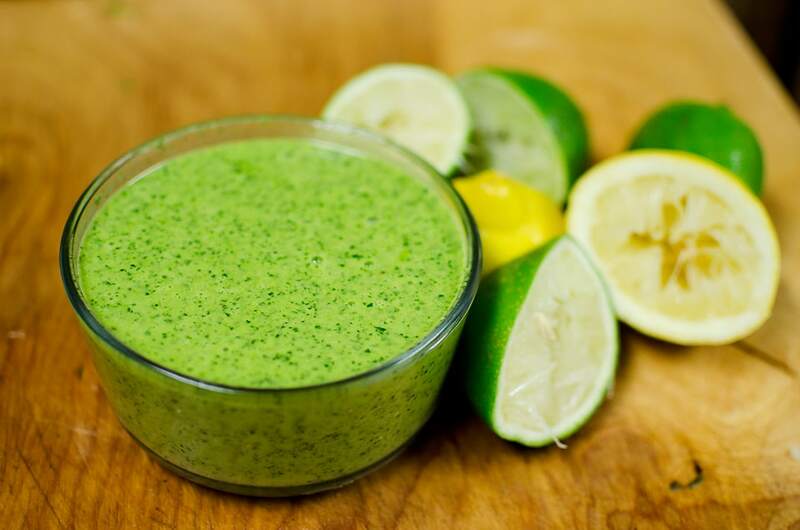 Combine all vinaigrette ingredients in blender or food processor until well combined and set aside. Grill the chicken in a sauté pan with pan spray or olive oil, over medium high heat about 4 minutes on each side. When the chicken breast is done cooking, remove from the heat and let sit for 5 minutes before slicing it into ½ inch strips. This allows the juices in the chicken to settle so it remains moist. Meanwhile, in large bowl toss the greens with the vinaigrette until evenly coated. 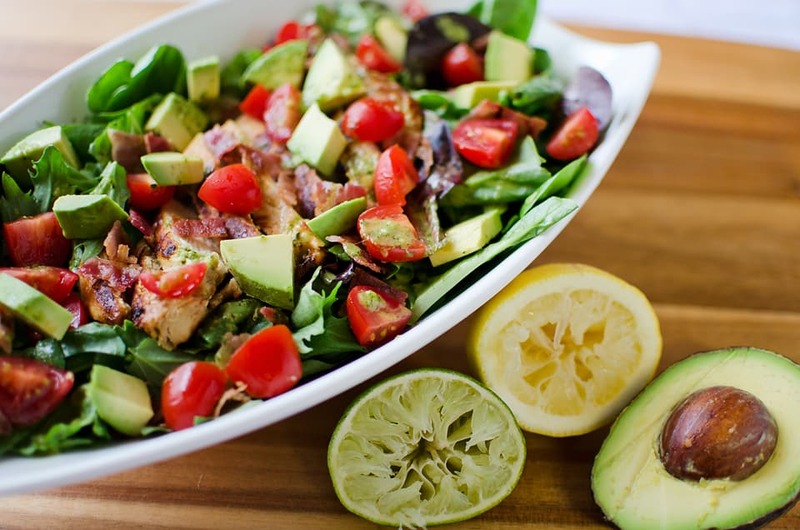 Top with the tomatoes, chopped avocado and crumbled bacon and chicken. Serve family style.